Very cool. I noticed your name isn’t in the description of the product nor on the cover page; is this intentional? 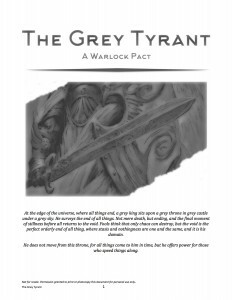 “The Grey Tyrant” did pop up when I did an author search for your name. The lack on the cover was because it just looked lame. Didn’t occur to me to put it in the description. Huh. If you think of it as freelancing for WOTC, the gaping maw seems a little bit less onerous (though it makes the whole arrangement seem weirder). Much freelancing is, sadly, terribly paid. (I’ve had trouble finding much that offered more than 2-3 cents a word, with no royalties…) But I very much enjoyed reading your experiences!